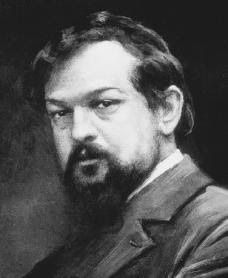 Today's Composer of the Day is Achille-Claude Debussy. He was an early modernist, often called an impressionist, although he hated that label. He was a very good composer. He had a daughter named Chou-Chou. He died of rectal cancer. He was also French. Go figure. Hopefully, we'll never run out of composers. The point is that the images are fun to look at, and that the several sentences of brief commentary are pointless, enjoy. I never knew his first name. Or his daughter's. Or, indeed, that he died of rectal cancer, which sounds like a hell of a way to go. That was a fun image to look at. Yeah, Achille-Claude is a badass name. But mostly in the history books and such he's just referred to as "Claude". Such is death. Can I sue for copyright infringement? I demand a percentage of your google ads!!!!!! Heh. Google ads. Good one. Stop by after we get some traffic!